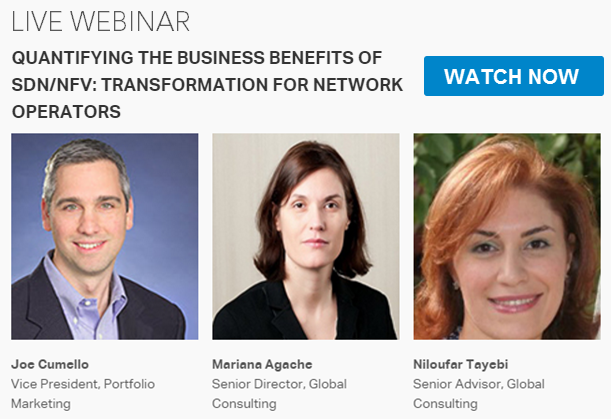 How do you evolve your network service offerings using new technologies like SDN/NFV to keep pace with the explosive growth of the technology? This is the million-dollar question. In this second installment in a two-blog series on SDN/NFV automation, Senior Director of Global Consulting, Mariana Agache, provides an array of enhanced service examples, from simple evolution to true revolution, that a communication service provider can offer. This transformation will enable extraordinary economic benefits, growing revenues from new services and/or new ways to sell those services, selling products into new market segments, and reduced cost structures especially in operations. This is the SDN/NFV services roadmap you’ve been waiting for. In part one of this two part series, I compared the automation of the automotive industry over 50 years to the evolution of communication service providers enabled by SDN and NFV. The expectation here is that this transformation will enable economic benefits: growing revenues from new services and/or new ways to sell those services, selling products into new market segments, and reducing cost structures especially in operations. Consider the benefits automation has provided to automotive consumers, from multiple car models to varied features and colors. Applied to communication service providers, imagine the services that automation could enable, the choices service providers would have in evolving their services portfolio; imagine how end-consumers could purchase those services in this digital era. To better understand the available choices, we need to revisit the end-users’ needs, which in our case are the enterprises. Their quest to digitize, to build Hybrid IT infrastructures that offer choice and desired performance at the right cost points, and that can be ordered and activated using self-serve digital interfaces, are all fundamental drivers of new service offerings. Carriers have started responding with service offerings that are on-demand and agile, dynamic and virtual, and offered easily across multiple administrative domains (i.e. across multiple carriers, or can combine connectivity and cloud offerings into a single service). At Ciena, we see connectivity service offerings from two perspectives: services that enable access to the IT Infrastructure and the Public Cloud, and services that interconnect datacenters to create a high performance Hybrid IT infrastructure, in alignment with our OPn architecture vision. The chart below provides an array of enhanced service examples that a communication service provider can offer. These are not necessarily new services. In many cases, they’re existing types of services offered to market with new features and attributes such as on-demand capabilities, dynamic bandwidth changes, or new commercial models for pricing. Let’s walk through each of these with some additional detail. IP-VPN and Ethernet services interconnect multiple enterprise locations, and are extending to connect into multi-tenant datacenters where enterprises co-locate or host their IT environments. These services are evolving to be offered on-demand, with self-serve control of the bandwidth requirements across multiple administrative domains and priced-by-consumption. MEF’s Third Network initiative helps define and standardize both the features and architecture required for such dynamic Ethernet services. These services are also being extended to connect directly into multiple Public Cloud Providers, which we call multi-cloud connect and which offers an assured performance alternative to the Internet. As the enterprise IT infrastructure resides in multiple private and public datacenters, enterprises and datacenter operators look for service offerings that enable higher performance while operating these dispersed datacenter environments. Traditional datacenter interconnect services such as Wave and Ethernet don’t offer the flexibility some enterprises need to interconnect multiple datacenter locations, driven by changing requirements for bandwidth, and the need to change interconnection points every few months. 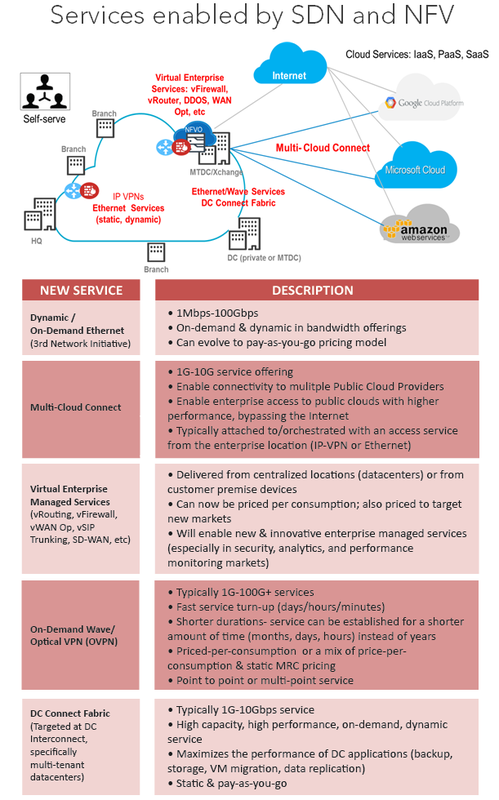 Therefore, communication service providers have started offering dynamic and on-demand Optical Virtual Private Newtork (O-VPN) and Ethernet services optimized for DCI, which we generically refer to as Datacenter Connect Fabric. This new service provides on-demand interconnect for multiple multi-tenant datacenters, offering the required flexibility to either the enterprises residing in these datacenters or the multi-tenant datacenter operators themselves. This service can be priced per consumption, or carriers can offer hybrid options combining fixed Monthly Recurring Charge (MRC) and per-consumption pricing. Datacenter Connect Fabric can also fuel innovation in other service offerings that use connectivity. For example, with the current MRC, it’s expensive to offer a Geo-Redundant Storage service where the 10G connectivity cost alone is approximately $5,000 per month. By pricing connectivity per consumption, we make it economically feasible to offer this service at not just an attractive price (15% premium over storage), but with high performance as well. Virtual Network Functions (VNFs) can now be used in this IT environment to deliver enterprise-managed services, enabling both an evolution and a revolution in this area. The evolution is in how there is now an easier way to deliver existing managed network services (e.g., a Managed Firewall, Managed Routing, Managed WAN Optimization, etc.) through virtualization, giving them the right associated price points to make them accessible to small and medium enterprises—currently an untapped market for these managed services. The revolution begins with new and innovative VNFs being brought to market and network operators offering them at market speed. There is tremendous innovation that can be brought to enterprises in the space of security, application performance monitoring and business analytics. Infusing that innovation into enterprise service offerings is key to the future success of network service providers. In the same way ordering a brand new car in today’s world simply requires a visit to the automaker’s website and selecting colors, fabrics, and features, the expectation is that these on-demand, dynamic or virtual services will only continue to grow as technology opens the door for faster and more customizable end user experiences. Ciena’s Blue Planet software enables creation of these new services. However, bringing these new services into a service portfolio and addressing the $33 billion global market comes with its own set of challenges, including pricing connectivity services per consumption. Even more, transitioning from managed enterprise services based on physical appliances to those based on VNFs brings not only challenges in pricing, but also in modifying the definition of the service and SLAs to better reflect a virtual delivery. During this transition, carriers face the additional hurdle of making their OSS/BSS sytems adapt to and support these new services, a significant task that requires careful consideration. Through our consultative engagement, Ciena helps carriers make the right decisions for their business. Our assistance is based on a deep understanding of these services and the market opportunity available, the best way to define and create value for them, how to accurately model the ROI, and the requirements they’ll put on OSS/BSS systems.